UNITED NATIONS, NY -- The U.N. Security Council met for the 26th time in emergency session on Ukraine, again without taking action, as the U.N. warned of a possible return to "full-scale fighting" in the rebel-held east. 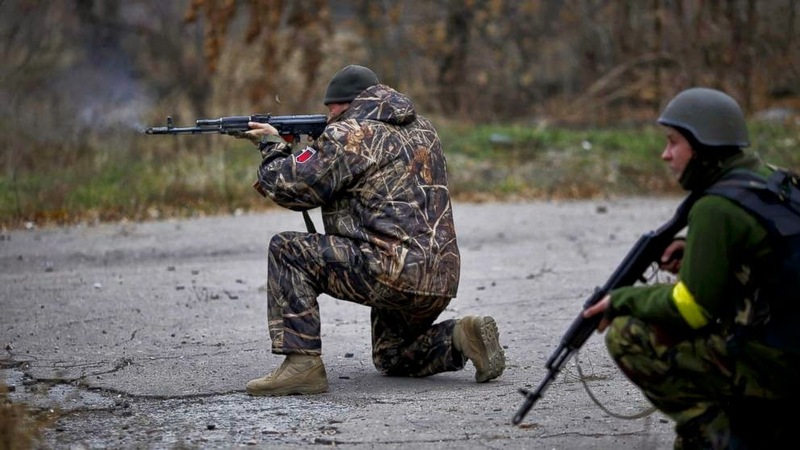 Ukrainian volunteer fighters shoot in the village of Peski near Donetsk, eastern Ukraine, Wednesday, Nov. 12, 2014. Fighting has continued in the east despite a cease-fire agreement between Ukraine and the rebels signed in September, and Ukraine and the West accused Russia recently of sending in new troops and weapons. Wednesday's meeting came hours after NATO's top commander said new columns of Russian troops and tanks have rolled into eastern Ukraine, which Moscow promptly denied. The main eastern city, Donetsk, has seen its heaviest shelling in recent weeks despite a cease-fire signed two months ago between Ukraine and Russia-backed separatists. The cease-fire has been violated almost daily, and the Organization for Security and Cooperation in Europe says monitors have seen convoys of unmarked vehicles near cities in the region. U.S. Ambassador Samantha Power told the council that Russia "talks of peace, but it keeps fueling war." The United States called the emergency meeting. Russia's deputy representative, Alexander Pankin, began his remarks by warning that council meetings should not turn into farces and called the storm of criticism from fellow council members "yet another foray into propaganda with new flourishes." The Security Council has met repeatedly on Ukraine since the crisis began early this year, but little action can be taken as permanent member Russia has veto power. U.N. Assistant Secretary-General for Political Affairs Jens Toyberg-Frandzen told the council that the United Nations is "deeply concerned over the possibility of a return to full-scale fighting." Either that, or Ukraine could face a months-long simmering conflict that would be catastrophic, he said. The conflict could also become a "frozen" one that lingers for years or even decades, he added. "Let me say very clearly: The only reason why the open war in the east of Ukraine hasn't started yet is because of Ukraine's restraint," he said. Luxembourg's ambassador, Sylvie Lucas, pointed out that more than 4,000 people have been killed in the conflict since April. The crisis in Ukraine is rooted in tensions over the country's shift away from Russia's influence and toward Europe, marked by demonstrations that ousted a pro-Russian president in February. Russia soon annexed the Crimea region of Ukraine, and the ensuing fighting in Ukraine's east has left relations between Russia and the West at their lowest level since the Cold War. Lithuanian Ambassador Raimonda Murmokaite, a sharp Russia critic, accused Russia of waging "an undeclared war" on Ukraine. She also slammed Moscow's announcement Wednesday that it will send long-range strategic bombers on regular patrol missions across the globe, saying it "all points to a more aggressive, unilateral Russian posture going well beyond Ukraine's borders."